One or more of the billboard companies with pending lawsuits against the city of Los Angeles have apparently made an offer to settle, because City Attorney Rocky Delgadillo is requesting a closed session with the City Council to transmit a “settlement proposal letter.” The request lists five active cases to be the subject of discussion in the closed session, which has not yet been scheduled. World Wide Rush v. City of Los Angeles: Challenged the constitutionality of the city’s off-site sign ban as applied to the company’s supergraphic signs. U.S. District Court Judge Audrey Collins last August ruled in the company’s favor, and prohibited the city from enforcing the ban at 21 different sites. The city has appealed the decision to the 9th Circuit Court of Appeals. Metro Lights v. City of Los Angeles: Challenged the constitutionality of the city’s off-site ban as applied to the company’s mini-billboards erected in numerous areas of the city without permits. The company won in U.S. District Court, but that decision was reversed early this year by the 9th Circuit. As of now, all the signs erected without permits by that company (now called Fuel Outdoor) are illegal. 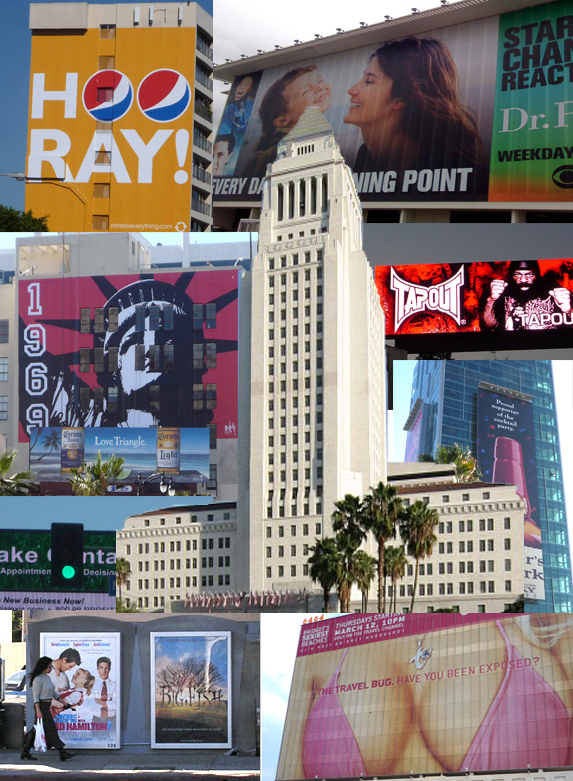 Sky Tag v. City of Los Angeles: Challenged the constitutionality of the city’s off-site sign ban as applied to the company’s supergraphic signs, which include the “statue of liberty” images by self-proclaimed artist and company owner, Michael McNeilly. In April of this year, Judge Collins issued a temporary injunction barring the city from enforcement against the company’s supergraphics at 18 locations pending trial on the merits of the case. Jamison 1055 Wilshire v. City of Los Angeles: This lawsuit by the owner of several properties where Sky Tag supergraphics were put up is essentially conjoined with the Sky Tag lawsuit. Summit Media v. City of Los Angeles: This lawsuit by one of the city’s smaller billboard companies seeks to invalidate the 2006 lawsuit settlement in which the city gave four billboard companies, including industry giants Clear Channel Outdoor and CBS Outdoor, numerous concessions, among them the right to convert nearly 900 conventional billboards to digital. The lawsuit is currently scheduled for trial in U.S. District Court this coming July. I think the new term for illegal advertising should be “ORGANIZED GRAFFITI”. It’s just as rude and in your face as graffiti that gangs use and it feels the same to me. We should spread this term because it has the negative connotations of illegal visual public activity and the term feels more powerful. I think the media would love to use it too.